The Rev. Peter Barnes is known for considerable insight into Muslim issues, as well as being a strong supporter of the Australian creation ministry. In February 2006 he engaged in a series of three public debates in Sydney, Australia, on ‘Islam or Christianity: which is of God’? 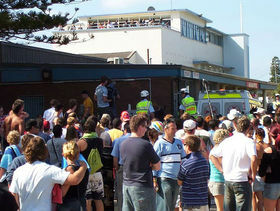 The following article of his was triggered by the December 05 ‘race riots’ in Cronulla, a beachside suburb of Sydney, that shocked a complacent nation. In it, Dr Barnes spotlights the way in which the decline of Christianity in this and other Western nations (a decline we have been saying for decades is inevitable when the biblical foundations are abandoned by the church and the culture in general) has left us exposed. A secular liberal society and a weakened church is no bulwark against the most prominent social problems of the day. The vicious riots that began at Cronulla beach on Sunday 11 December spilled over into payback outbursts of violence in Maroubra and Sans Souci the next night, and continued to splutter and fizz for the next few days. We were all confronted with some ugly scenes. Both sides — mainly drunken and hedonistic surfies versus testy and vengeful Lebanese youths — were full of venom and hatred. Two lifesavers had been bashed by a Lebanese gang a week before the riot; a surfing lout chased a Muslim woman, ripped off her hijab, and then waved it around in a display of what he obviously supposed was triumph; the Uniting Church at Auburn was burnt down; and, also at Auburn, there were shots fired in the direction of a Roman Catholic school as parents and students were singing carols. We had read of riots in France, and thought that it would not happen in multicultural Australia. But it has. Gurus of all kinds have offered their spin on events. The media, including even the New York Times, have blamed racism, even sheeting home the prime responsibility to white supremacist activists. Somewhat similarly, Mike Carlton and David Marr have blamed sections of the media, especially 2GB’s popular loudmouth, Alan Jones. Others — notably the retired detective Tim Priest — have blamed the rise of Middle Eastern gangs of criminals who are disaffected from Australian culture. Many Lebanese males have exhibited a ‘chip on the shoulder’ attitude to the wider community, and an addiction to portraying themselves as the victims of anti-Muslim sentiment. They cannot see that Wahhabism and thuggery are scarcely distinguishable. In the 1990s Samuel Huntington wrote of ‘the clash of civilizations’, but these riots have looked more like the end of any civilization — rather like Munich in the 1930s when Communist and Fascist mobs tore into one another. The truth is that what was once called Christendom is now that part of the world where the Christian faith is mocked and scorned in schools, academia, and much of the public arena. That is a most perceptive comment. Life surely consists of more than watching episodes of Big Brother Uncut and other such gems. Senator Vanstone’s outlook reflects a predilection for lazy thinking, but it is in fact a common view. Indeed, it is the prevailing one in the West. When France banned Muslim head scarves and large crosses in schools and government offices, President Jacques Chirac claimed that ‘Secularism guarantees freedom of conscience. It protects the freedom to believe or not to believe.’ It, of course, only protects the freedom not to believe, and it conveniently sidelines all Christians — and for that matter, all adherents of other faiths — from the political arena, leaving it available only for the humanists. Recently, Janet Folger has spoken not of the marginalizing of Christianity but The Criminalization of Christianity (Oregon: Multnomah, 2005). Quoting the Bible in public can be illegal in Canada; a town in California has removed a nativity scene but spent $500,000 of public money on constructing a statue to an Aztec god; Google recently banned an advertisement on a Christian group’s website because it was critical of homosexuality; two women who advertised for a roommate in Madison Wisconsin declined to take in a lesbian, and were forced by the Equal Opportunity Commission to attend ‘sensitivity training’, pay the lesbian $1500, write a formal apology, and have their housing situation ‘monitored’ for two years; while here in NSW representatives of the Board of Studies have told Christian schools that they cannot cite biblical verses in favour of corporal discipline to parents. Dietrich Bonhoeffer saw this from his Nazi prison cell in the final years of World War II: ‘The west is becoming hostile towards Christ. This is the peculiar situation of our time, and it is genuine decay.’ Australians are likely to bemoan the loss of what some call ‘Australian values’. That kind of patriotism is, said Dr Johnson, ‘the last refuge of a scoundrel’. It misses the point. The problem is that Australia has descended into a huge moral and spiritual vacuum. Democracy will not save us, nor will education schemes to promote multiculturalism and interfaith harmony. The silliest, and ultimately the most dangerous, interpretation of the Cronulla riots came from Rev. Bill Crews of the Uniting Church. He blamed the fundamentalists on both sides, as if Cronulla beach on 11 December was just crawling with strict Bible-believing evangelicals who were on the lookout for unbelievers to evangelise. That is about where we are up to.